When everyone is a suspect, whom can you trust? 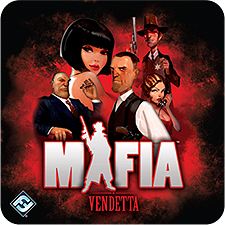 In Mafia: Vendetta, players work together to fight against the criminals who threaten their town. But some players share a secret: they are in the Mafia! Suspicions are voiced, accusations made, and executions carried out...but one wrong move, and another innocent body is found in the morning. This fast-paced party game of player elimination will be a "hit" at your next game night!